Don’t Ever Do That Again! My dear daughter, mother of three under 6, wife of distracted lawyer-husband, granddaughter of a beautiful loving stubborn grandmother, offers to drive me the 1 ½ hours to the airport. “You shouldn’t leave the beach house on your vacation – I’ll call a service,” I insist. I laugh. Yes, a 3-hour round-trip Friday afternoon drive on a NJ highway can seem preferable to the family-sized drama occurring as one child reaches for the other child’s toy, the toddler pulls at his diaper, the grandmother asks who’s going to make another pot of coffee, and the husband races out to the deck to finish a client conversation. Driving with the windows down, salt air sifting through our skulls as we nod to the beat of the ‘60s station, we forget his warning. Thirty minutes later, my cell phone bleeps louder than a sheep caught in barbed wire. 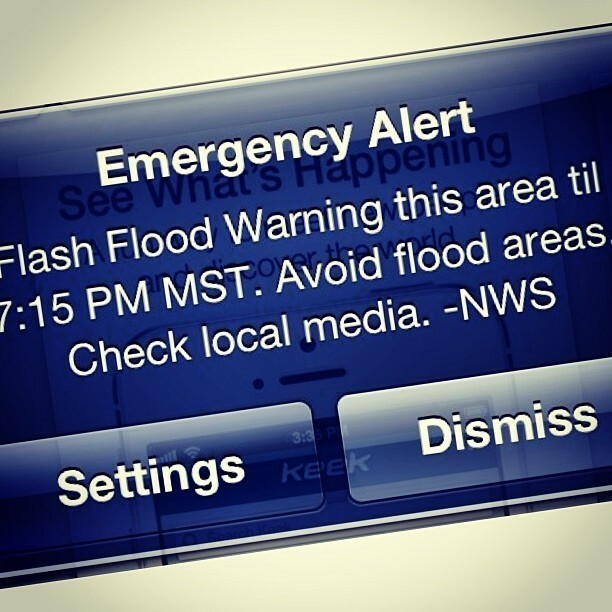 A text follows the screeching alarm: Rain Storm Ahead – Flash Flooding. “How do they know where I am?” I ask as one big rain drop plops on the windshield. “Who are ‘they’?” daughter asks. Too existential a question for me as simultaneously a deluge begins; her gas gauge pings Empty; the highway traffic slows to a crawl; and my bladder suddenly screams, Hafta pee – now! Daughter turns the radio volume up and we both begin to sing Lou Christie’s Lightening Strikes, louder and louder as the rain pummels the car, reminding my bladder that it really needs to let loose. Ping! Ping! 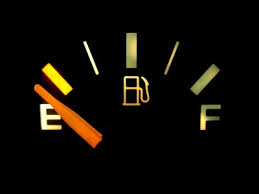 The gas gauge hits below empty. The car stops still in the heaviest traffic jam I’ve seen since I tried to cross the George Washington Bridge during commute time. My watch ticks away – 55 minutes to make my flight. My eyes blink from the sharp lightning bolt ahead, the following thunder rattles my bladder, and daughter drives with a serene smile on her face. When the hell did she learn to cope with stress? “Gas Ahead” sign turns my heart into a butterfly. She twists the wheel as if we’re in a video game and squeezes ahead of dozens of car to get to an empty pump. Back on the slippery streets, we listen to her phone’s GPS system tell us where to go. “NOT THAT LEFT!” I shout. Daughter doesn’t even flinch a muscle as she follows the soothing voice of the woman in the phone. We hit 132 pot holes. My bladder feels every single one. Daughter’s car slides into first base, I mean, the departure entrance. We both jump out of the car, smack into each other as we kiss, “love you, love you,” and I lift my 200-pound suitcase as if it’s light as a feather. A miracle occurs. In 4.5 minutes I’m checked in (note: tears help), security takes 4.8 minutes, and I race toward my gate. But first, I spy the sign for Rest Room. DON’T EVER EVER DO THAT AGAIN. 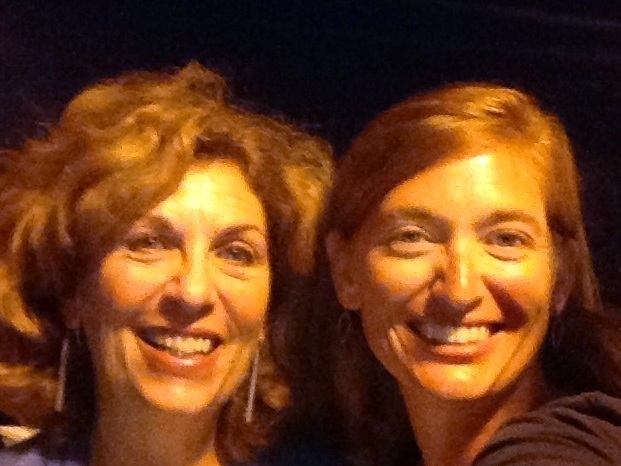 Oh Pam….this is such an awesome blog….I love, love, love reading whatever you write. I am amazed at how well everything finally did go and that you actually made your flight! You definitely need to give your self a big pat on the back cause I am sure you are where your precious daughter learned all of her patience and awesome qualities….from you sweetie!!! By the way….I love Lou Christie’s Lightning Strikes!!!! And in case your ears were burning on Wednesday, a few of your awesome high school pals got together for lunch and I brought you up while talking about books…check out my FB page for pics of who all was there to remember you!!! God bless you dearest friend!!! Love you and your writings beautiful Pam!!!! Ahh, now I understand why my ears were tickling on Wednesday. I loved the photo on FB of you all. Brought back great memories, to see my old, I mean, back-then-buddies from PHS. Wonderful! You have nerves of steel! Love the post! Oh Pam. I laughed at the vision of you and Nadine singing to the sixties while lightening, thunder, monsoon-like rain, a chattering bladder and an empty gas tank all surrounded you…but, I also commiserated having done similiar oopses! Nadine, by the way, is definitely a keeper! In the wonderful picture of you and Nadine, it struck me that she had a look of BJ…do you see it?.We’re good. We showed my parent’s house again yesterday. The first anniversary of Mom’s passing is tomorrow, so I’m pretty emotional. I’ve been thinking of you and the anniversary with love and a big huge hug. Loved reading your post this morning! One thing I know for sure – life will MAKE you do it again! OMGosh. What an ordeal. I was right there with you, nerves raw, crossing my legs, looking at your daughter. Her calm unnerved me even more. What a story. Thank goodness you found a Rest Room and made your light. THANKS. I admit, it was a lot more fun to write about AFTER than experiencing it during. But they’re all worth it, the ordeals, aren’t they, if they give us writing material? Ha Ha. And Pam…? Might I recommend not to ever do that again!! LOL! I laughed aloud with that description! And you will do it again. Groan. I’m afraid you’re right. I’m perpetually playing catch with the clock, and I never win. THANKS for being such a wonderful follower! What a story, I felt for you , especially the peeing and thunderstorm part. Years ago my husband ( just a boyfriend at that time) run out of gas in the middle of the night on the way to Los Angeles with three girls in the car trying to catch a charter flight to Europe. We made it. This was so funny (well not for you at the time) Don’t they have restrooms at service stations? I have a few similar stories mind you. One that involves missing a ferry by 2 minutes. I always say never again but guess what, we do it again anyway!! Thanks for sharing. Didn’t have time to use the service station rest room!!! Never again — until the next time, right? Ha. Oh. Good. Lord. How nerve wracking! It made me need to tinkle! I know, just the power of suggestion… thus the deluge of rain did NOT help my situation. 😉 Nice to see you here! This sounds like my daughter, who has two boys, and reminds me of my daughter-in-law, who has a combined family of four little ones under 10. Both would take off, like a bat out of “He-double hockey sticks!” Road trips are wonderful bonding experiences, but your trip seemed too perilously true! I have to use the restroom often, annoying passengers in the car, ‘We just got on the road, Mom/Robin!’ I laughed so hard as the trip went on, with road potholes, distance between the time being just shortened by each delay, then the bouncing bodies, “love-love” and off into the clear, blue yonder! Perfect, in tone, quality and a great short story! It’s why I would never have a “water feature” in the house. Relieved that you were relieved without a mishap. I know the blessed feeling – recounted here. A story from my adolescence. Oh my, I’m just back from reading your coconut-oil-challenged-chaperone day. Great post, and funny (in hindsight, I’m sure!). I agree, a ‘water feature’ at home (or worse, the office!) is not a good idea. So funny and clear and sharp, Pam! Thank you – such a compliment from an artist like you means a LOT. Oh my goodness, this story sounds like so many of my nightmares come true at once! I fear running out of gas so I always fill up when the needle starts pointing below a quarter tank. I fear having to pee while stuck in traffic! 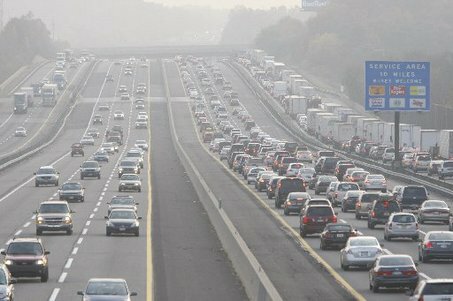 I generally try to plan any kind of highway trip to avoid peak traffic times – although that is one that even the best of planners can not always avoid! I’m glad you made your flight. PS I finished The Right Wrong Man. Fun read! I would have been so nervous I wouldn’t have been able to see straight! Oh, dear Pamela, you tell the most magnificent tales! Thanks! But I assure you, you would NOT have wanted to be on that trip!!! Haha.